On your way from Tikal to the Western Highlands Semuc Champey ("Where the river hides under the stones") is a must-stop for some hours. Semuc Champey is a natural monument near Maya town of Lanquín. Try to catch a (mini)bus from Coban to Semuc Champey directly, or to Lanquín . Semuc Champey consists of a natural limestone bridge under which passes the Cahabón River. You'll find stepped, turquoise pools, that form a popular swimming attraction. 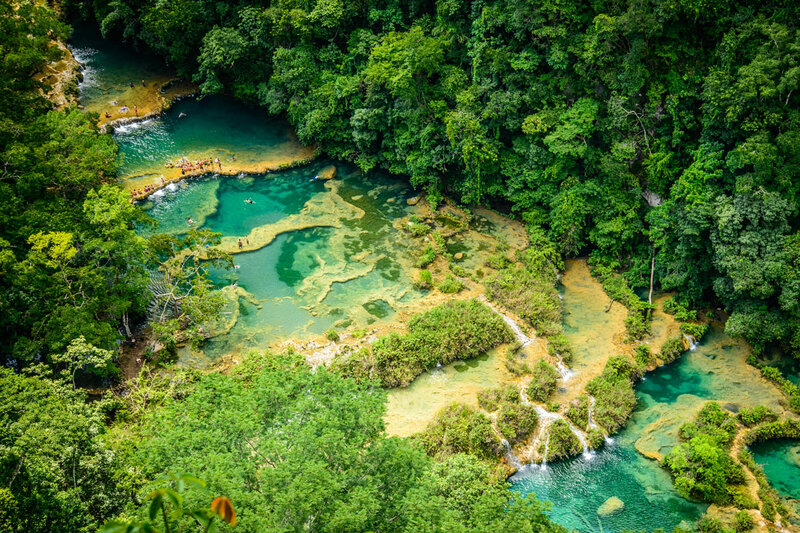 Of course swimming is the main activity at Semuc Champey, but it's also great to explore the nearby water cave, or tube down the Cahabon River. Lanquin offers quite some low-budget hostels (although price tend to rise) and comedores. Guatemala, land of Maya people, mysterious traditions and amazing landscapes. Quite a while ago ;-) I stayed in Guatemala for about six months, to do my traineeship at Inguat, the Instituto Guatemalteco de Turismo. Since then I follow this country and read and write about it.